I find that the best thing for me to do during a blizzard is bake. Shovel? Rescue my car? Nah. Bake tasty muffins? Wrap presents? Listen to Christmas music? That’s more my style. We woke up to a blanket of white. Or, several thick blankets. We are expecting up to 16 inches here in Minnesota. Take a peek. 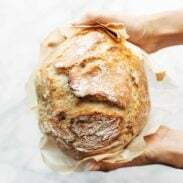 Because I like to bake on Saturdays, and because we were pretty much stuck in the house, and because we had an unexpected overnight guest as a result of the weather… I searched the kitchen high and low for anything that could be used to create a last-minute breakfast. 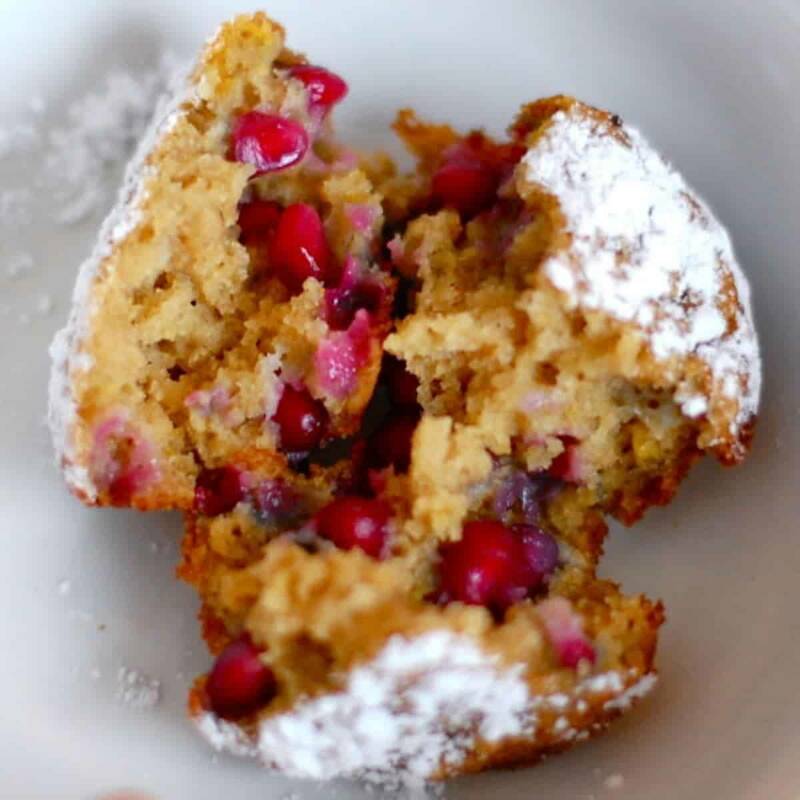 When I came across a lonely pomegranate, the light bulb came on: Pomegranate Orange Muffins. I grabbed an orange and started zesting. The pomegranate was seeded, leaving its usual stains around the kitchen and on my clothing. Out came the sugar, flour (I barely had enough), eggs, and the butter. Wait… no butter. Oil? Wait… no oil, either. Bad luck. I was stranded with no chance to get to the store (not like I really wanted to) and the fate of our breakfast was on the line. So I once again started scavenging for any kind of butter replacement. And, to my great joy, what did I find in the fridge but one little snack pack of applesauce. Hallelujah! I didn’t plan on these being low fat, but I’m not complaining. They were dense, sweet little nuggets of bright color. A dusting of powdered sugar on top, and that was that. The recipe for pomegranate orange muffins is super simple and makes the perfect winter breakfast. This is what the tops of our bushes look like… and there’s no bush in that mountain of white. That’s all snow! And this… This would be our road. Can’t see it? Now you know why we have an unexpected overnight guest. I’m seriously putting off addressing this issue. As for the boys, they have braved the blizzard – on foot – to get some burritos. Desperate times call for desperate measures. These were yummy! For the flour I did half white and half wheat. I also used frozen pomegranate seeds, which is one of my favorite shortcuts; I can’t stand deseeding fresh pomegranates. I rarely bother to leave comments but the consistency of the batter was so liquid, it was all wrong. The only modification I made was using oil instead of apple sauce. Very disappointed. I loved the texture of these – your ratios were great. I had to substitute a flax egg, so they fell apart a bit, but that’s my own fault. I love the texture of the rolled oats in here, too. The hint of nutmeg was a brilliant addition. Next time I try these, I’m going to overmix the final batter, to see if it improves gluten development and causes the muffins to stick together better. This was my first time baking with pomegranates. I noticed that the flavor of the pomegranates didn’t shine through like I expected. Maybe I’ll try bit of pomegranate molasses (along with less added sugar) next time. Thank you for a really wonderful, outside-the-box recipe! My pomegranate tree is heavy with fruit so I started to look at recipes. Made these over the weekend and we loved them. They came out perfect, thanks! Maybe I missed it. But how is the boiled water used? 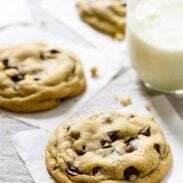 I will absolutely be making these again! I used full butter, half whole wheat and half white flour, juiced 2 oranges and zested both for a very noticeable orange taste. Delicious!